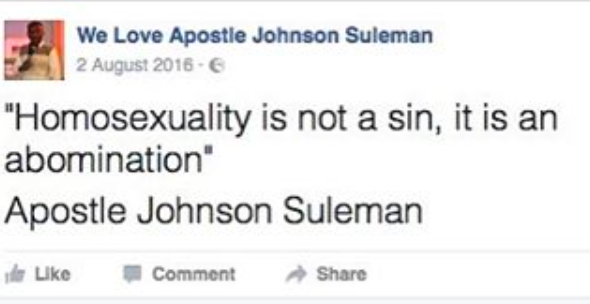 "In case you don't know, Apostle Suleman, the adulterer has an opinion about homosexuality. Him like many Nigerians are happy to choose the sin they are most comfortable with. I am guessing the stupid man wrote this while he was giving his mistress a head, and to think god actually speak through these kind of people and you wonder why people like me consider this whole god business dubious and useless? Well one day my people will wake up from their sleep and slumber and know there is no god, everything is just hustle and 419."